I am done with my finals – hooray! My Christmas break hasn’t exactly started yet, though… This weekend I will be studying for my 3-year comprehensive exam, which we have to pass before we can begin our rotations next Spring. I can’t believe I am almost done with 3 years of pharmacy school – the time is going by so fast! Are you done with your Christmas shopping yet? I still need to pick up a few things this weekend. It is so cold and rainy today so I plan on baking cookies, drinking tea, wrapping myself up in a blanket and studying on my couch! I know, it doesn’t sound like the most exciting Saturday, but sometimes lazy weekends are the best! 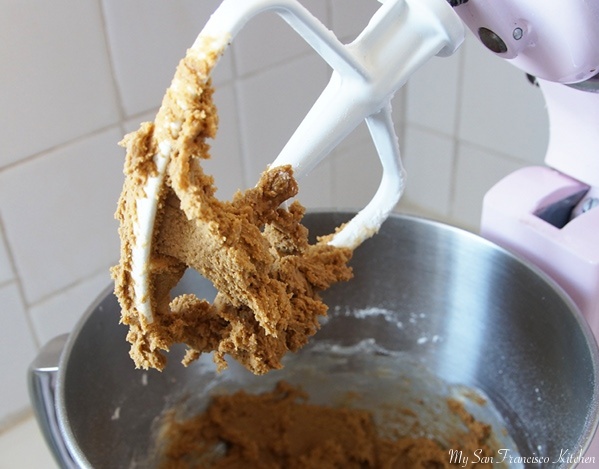 Using a standalone mixer, cream the butter and sugar together with a paddle attachment (can also use electric hand mixer). Add the egg, followed by the molasses and spices while beating on low speed. Add the baking powder, followed by the flour a little at a time while beating on low speed. 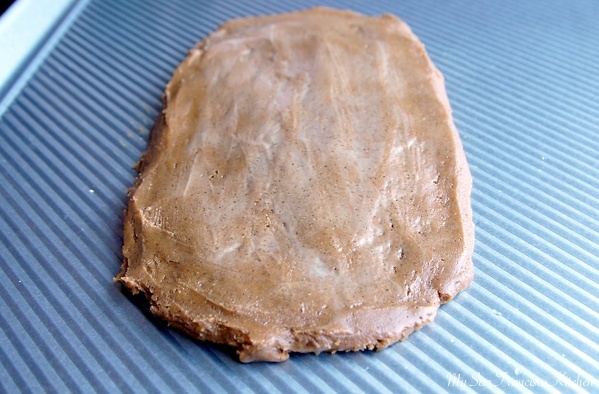 Once the ingredients are combined, use a spatula to transfer the dough to an ungreased baking sheet. 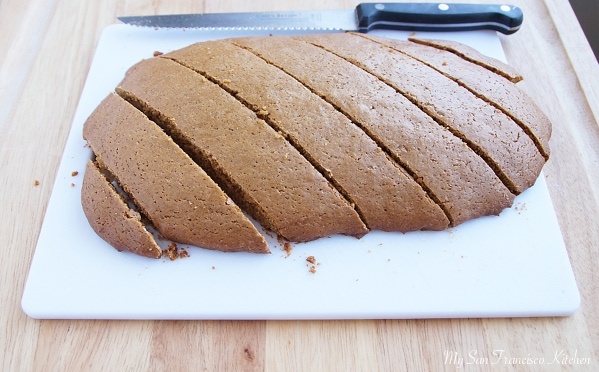 Form a flattened rectangle, about ½ inch thick, in the center of the baking sheet. 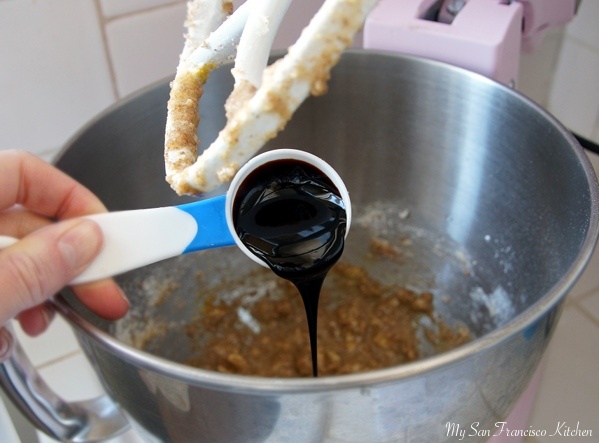 Tip: wet your fingers with water while working with the dough to keep it from sticking to your hands! Spread the tbsp of milk evenly over the top and place in the oven. Bake for 20 minutes, then remove from the oven and cool for 10. Slice the rectangle diagonally until you have 6 biscotti. 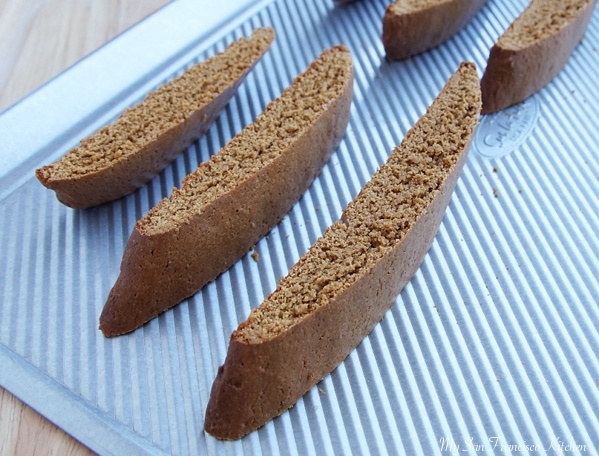 Turn the biscotti over onto one of the inner sides and bake at 325 degrees F for 10 minutes. Turn the biscotti over onto the other side and bake for 8 minutes. Alternatively, you can turn the oven off at this point and let them "dry" in the oven until they reach your desired texture (I prefer mine a little bit soft, but some people like biscotti very hard). Remove from the oven and let them cool for a few minutes before transferring to a cooling rack or plate. In the meantime, stir the milk and confectioners' sugar together to make the frosting. You can add more milk/sugar to reach a consistency that works for you-it should not be too runny, or too thick. Add the frosting to a plastic ziplock bag and cut a small hole in the corner. 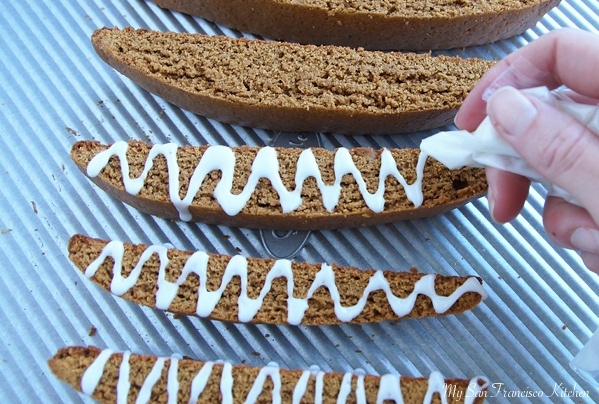 Drizzle the frosting over the biscotti, and let set for 15 minutes before serving. This entry was posted in Breakfast, Christmas, Dessert and tagged biscotti, christmas, cookies, gingerbread, holidays. This looks delish! And congrats on being done with finals…and good luck on your exam! Mmmmmm I bet these smell OHMIGODSOAMAZING! They look delicious and def. would make great gifts! I think I’m done with Christmas shopping, but I need to re-inventory my gifts to see for sure!! 🙂 Congrats on finishing your finals!!! 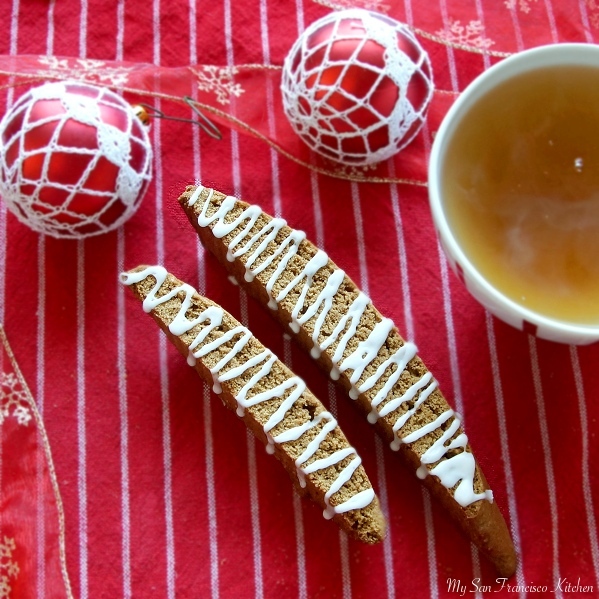 Your Gingerbread biscotti looks amazing, I can only imagine how wonderful it smells. Your right today was a lazy Saturday! What crappy weather! I stayed in all day and didn’t do much but relax!! It was definitely nice just to relax all day!! 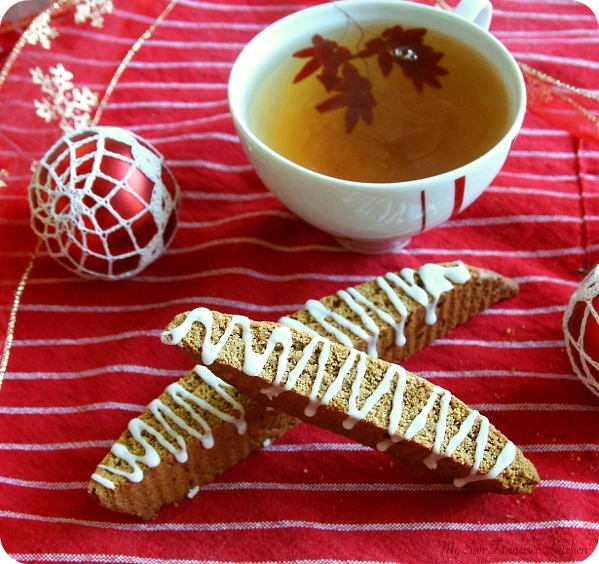 Great looking biscotti – these definitely say holidays! And congrats on finishing your finals (and good luck on that comprehensive exam). Pharmacy school is tough – you get to learn way more chemistry than most doctors know. It’s hard work, but the payoff is worth it. Anyway, good post – thanks. Thanks John, especially for the motivation!! these look like a fantastic recipe to bring to a holiday party. i’m actually going to one later tonight and i’ve been looking for a dessert to bring. think i’ve found it! What a perfect holiday treat these look delicious! Loving this biscotti!!! Beautiful! Congrats on finishing your finals! I love these! How perfect for dipping in coffee during the winter months. A must make. I was looking for a biscotti recipe and this IS it! Thank you.